When my son was growing up, it was a challenge to get him to eat more fruits and vegetables. I found that if I presented the food in a fun and attractive way, he would sometimes eat even more than I hoped he would! If you’re a parent or grandparent with a little one who’s a bit of a fussy eater, I’m sure you can relate and I bet you have your own ideas for fun ways of arranging fruits and vegetables for kids. I hope I can show you some new ideas in this post and share some photos with you that your children in your life will enjoy too! Eating fruits and vegetables is usually more fun for kids when they can be involved in the process. If the kids know what they are eating and that they have some control in the matter, it will help to decrease some of the stress around food, especially for picky eaters. 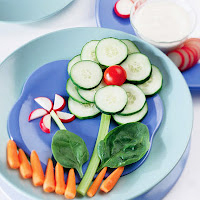 Here are some ways of arranging fruits and vegetables for kids that will make them more interesting and inviting. These are all easy ideas that you can do at home with your kids. No special equipment is required other than a kitchen knife, cutting board, cookie cutters and skewers. 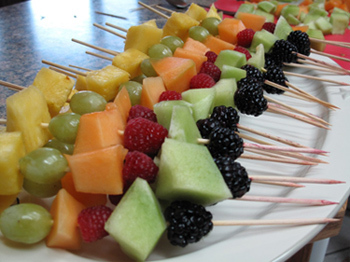 One of the easiest and more appealing ways to make fruits and vegetables for kids is to chop them into cubes to make fruit and veggy kabobs. With supervision, children can help with this too. 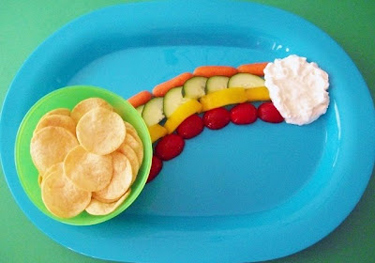 Another idea is to arrange fruits and vegetables to look like something fun like trees or a rainbow. 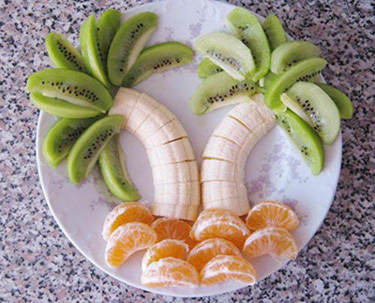 This next photo would be fairly easy to make by slicing up banana and kiwi and peeling some baby oranges. As a treat, you can always serve your some dip with your fruits and vegetables for kids. For example, fruit skewers can be dipped in yogurt and rolled in some crushed nuts or coconut flakes to make them more interesting! 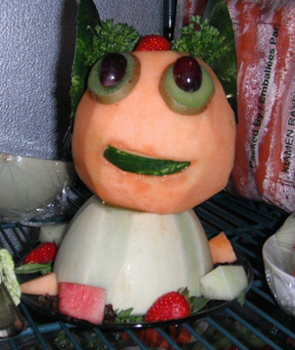 Here are a few examples of carved fruits and vegetables for kids arranged in amusing ways. Your kids will probably really enjoy these photos! 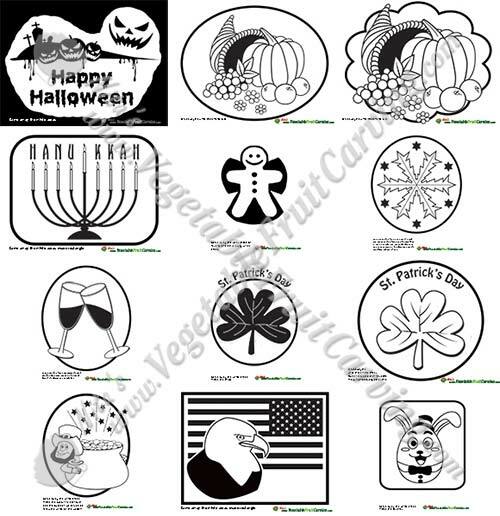 Some of them are from unknown sources and some are from readers of my blog and customers of my Vegetable and Fruit Carving Course 101. 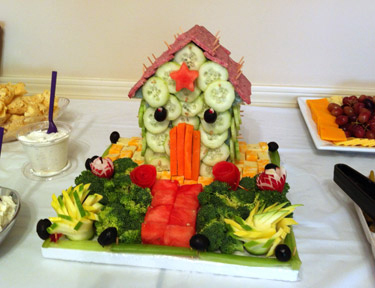 Yes, you can learn to make fruit and vegetable carvings and surprise your friends and family! 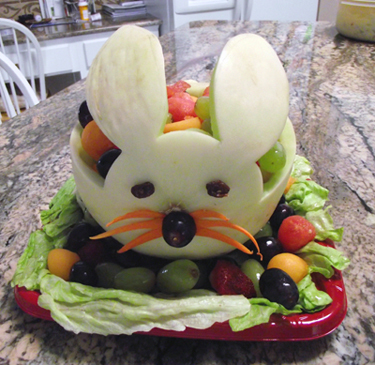 Isn’t that melon bunny cute? It’s really easy but always gets big reactions. It’s also the perfect bowl for serving fruits and vegetables for kids! If you want to learn how to make this, you can check out my Melon Bunny DVD lessons in my online shop. 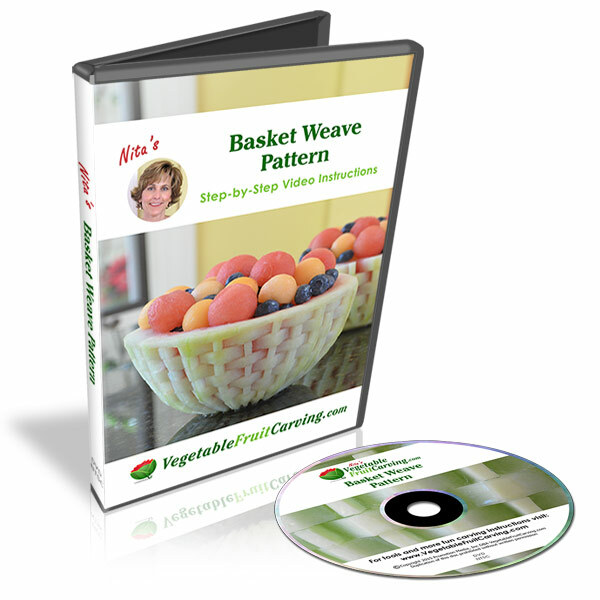 This lesson is available separately or as lesson 3 of my 11 Week Vegetable and Fruit Carving Course for Beginners. You’ll learn to carve a variety of fruits and vegetables to make attractive displays, garnishes and edible bouquets. 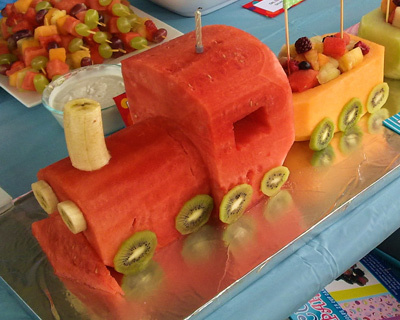 There are so many ways to get creative and playful with fruits and vegetables! For March Nutrition Month, I challenge you to come up with Creative Ways to Arrange and Serve Fruits and Vegetables for Kids – and for Yourself! I challenge you to get creative with making fruits and vegetables for kids in the kitchen for March Nutrition Month. Even if it gets a little messy, it’s all part of the fun! 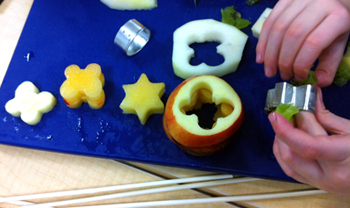 Here are two photos from a reader who loves getting her kids involved in the kitchen. 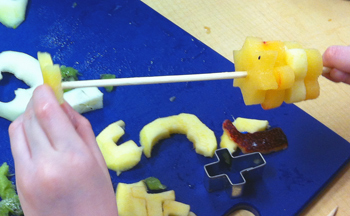 The kids used cookie cutters to make shapes out of their fruits before putting them on a skewer. I hope you enjoyed this post on fun ways to serve fruits and vegetables for kids (and grown ups) in your life! I love your carvings & ideas. God has truly blessed you with an Amazing talent. I hope to be able to take lessons soon. Thanks for everything! I”m glad that you found it useful Shalini.